Just as you started to think that jazz organ was another male dominated instrument in the world of jazz, the females following will definitely change your mind about that. Shirley Scott(b March 14, 1934 d March 10, 2002)was known as the 'Queen of the Organ'. She started out as a pianist to accompany her brother on sax, in high school she turned to trumpet, but when she heard early organist Jackie Davis, she stayed with the organ. Scott found success in 1953 playing with Eddie 'Lockjaw' Davis. She played with him for several years. In her long career she recorded over 50 albums. She was married to saxophonist Stanley Turrentine for 10 years. Turrentine recorded many albums with Jimmy Smith and other jazz organists, as well as his own solo recordings. Her sound is a bright sound with vibrato, maybe inspired by gospel. It works for jazz for sure, a great groove. In her later years she taught jazz history and piano lessons in her position as Assistant Professor of Music at Cheney University. In 1993 she was also music director for Bill Cosby's 'You Bet Your Life'. Not all jazz organists are deceased. There are probably more around the world now than there ever have been in the history of jazz organ. Rhoda Scott(no relation to the forementioned), 'The Barefoot Lady,' grew up a minister's daughter, and trained at Manhattan School of Music. Her music includes the influences of gospel, jazz, classical and ethnic music that she has been surrounded with all her life. Making her home in Paris for sometime now, she constantly tours Europe, globally spreading the word of jazz organ. Though not listed on her website, she is visiting the West Coast soon to honor Jimmy McGriff and give some concerts stateside. She earned 'the barefoot lady' monniker as she has played the organ pedals barefoot ever since she played in her father's church. Most classically trained organists wear a special shoe, jazz organists tend to wear leather soled dress shoes. But Scott has influenced many others both jazz and classical to do the same. The trailer for the jazz organ documentary Hammond Heroes, which you can view shows clips of most of the important jazz organists. There is a short clip that shows Scott working her magic on the pedals sans shoes or socks. Rhoda Scott also has a listed biography on Pete Fallico's www.doodlinlounge.comwebsite. Trudy Pitts is another jazz organist and still alive and performing. 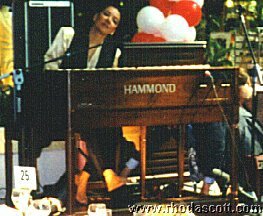 Though she generally favors piano these days, she is still known to perform at some of the jazz organ hotspots across the nation. Pitts, also a native Philadelphian, is underrated compared to her contemparies. That may be due to her propensity of leaning towards a more pop oriented sound. But she can be found doing just fine on more up tempo tunes, in addition to singing when she finds it necessary. She attended Julliard and got a degree from Connecticut College for Women. 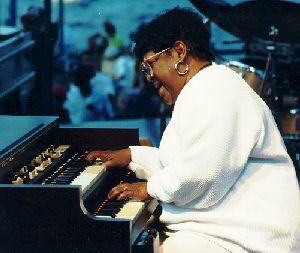 Her playing style was generally less bluesy than her contemparies due to her classical approach and that she used her feet more than many of the other jazz organists.